Good pre-owned condition with normal signs of wear, could use a polish.Some wear on heels.Please view all pictures , they are part of description. Alegria Black Leather Mary Jane Clog Strap 37 7 Comfort. Condition is Pre-owned. Shipped with USPS Priority Mail. Very good used condition. Some scuffs on toes. Soles are in great shape. Very comfortable. Please let me know if you have any questions . They are in nice, gently used condition. I try my best to be as clear and honest as possible. Keep in mind that they we're use and expect what you see on pic. Pre-owned- Alegria Joleen Black Embossed Comfort shoes Jol-429 EU Sz 37- US size 7. See photos for condition and details. US size obtained from size conversion chart on manufacturer's web site. (Item Location, Rack F6). This is a pre-owned pair of shoes,that still have a lot of wear left in them. Black Alegria Size 7, 7.5 Woman's Leather Buckle Clogs Insole Missing. Shipped with USPS Parcel Select Ground. Bottoms of shoes are dirty. Insoles of the shoes show signs of wear. Length (heel to toe)-9.75". Pre-owned, but in good condition. Size - 7M (EUR 37). Color - Black. SEE PICTURES FOR VISUAL CONDITION & CONDITION OF SOLE (USE ZOOM). Material - Leather. Alegria Lauryn Comfort Shoes. black iridescent leather uppers. size 37 or US 7-7.5. leather lining. Alegria DEB-688 Black Slip-On Clogs (women’s 37 / 7). Condition is Pre-owned. Shipped with USPS Priority Mail. They are gently used and in very good condition. They are a BLACK with an iridescent accent in color. They are leather upper & lining. These have on the left shoe toe a small scuff. Tread of sole in GUC. size 37 (7/7.5 US). length 9.5" heel to toe of INSOLE. no tears to outer leather. Alegria PG Lite Classic Black Leather Clog Shoes. heel; 1.3-in. • Hand-sewn leather lining. • Superior arch support. • Removable footbed (you can even insert your own orthotics). • Adjustable buckle strap allowing for a custom fit. Pre-owned in very good condition. Not in original box. Getting sucked into a swirling, twirling blend of color isn't such a bad thing when it's as pretty as the Alegria Classic in Vortex. Get carried away in the deep blue, pink, and purples of this happy clog. It has the added feature of a rotating strap that can provide a slingback for increased stability. If necessary, the footbed is removable to allow space for custom orthotics, and the interior has extra depth to create a roomy fit. Also if the item is used it may show signs of normal wear which may consist of minor scratches, scuff marks, or marks. All of the information about the condition of the item will be listed in the item condition. Keli PRO nursing shoe. Print is "Persian Rug". The elastic goring at the instep and padded tongue provide a super comfortable fit. The slip resistant outsole also makes this shoe suitable for work or play. Shoe Color: Black. Shoe Size: Wom en's US 7 - EUR 37. - Insoles in tact. Alegria - Paloma Style PAL 531 - Size US 7 M EU 37 - Mary Janes Styling Shoes - Black - Embossed Leather - Worn Once In Excellent Condition. The original "Happy Clog" that started it all. The Classic clog is available in a wide range of colors and patterns to match your favorite wardrobe. Alegria by Pg Lite Bel Women's Black Patent Mary Janes Shoes Size EU 40 US 7 Please see photos for color, style and condition. ***These shoes do not come with insoles*** Shoe Trees if pictures NOT INCLUDED. We accept returns within 30 days if the item sent back in the same condition. So purchase with confidence. Please see photos for color, style and condition. School's in session with the Alegria Belle in Jet Luster. The soft black leather upper is topped with an adjustable velcro strap and a small silver side button for that added detail Alegria is known and loved for. Part of our professional collection created with health care professionals in mind comfort and support are top of mind with this slide on. A slip resistant PU outsole designed for safety as well as pain relief for your feet, legs and back combined with a fully enclosed back protects your heels while the stain-resistant upper makes clean-up a breeze! Alegria Keli Black Embossed Paisley. Elastic at the instep allows for a secure fit. Lab rated slip resistant outsole and stain-proof leather coating. Career fashion outsole featuring a lightweight, slim silhouette. ALEGRIA by P.G. LITE "ETTA BLACK BURNISHED SNAKE PRINT #ETT-711". - lace up entry. - man made platform soles. A few surface toe scuffs on manmade platform soles, see photos! - HEEL HEIGHT APPROX 2.5" with an 1" of platform sole. 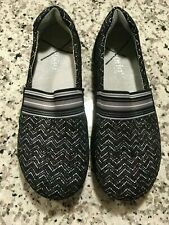 Alegria DEB-688 black slip-on clogs in women’s US sz. 7. They are pre-owned but in good condition, show wears insole heel. Please examine all photos closely. Alegria black slip-on clogs. Preowned, plenty of wear left. Very comfortable! Women's size 7.